Longer, steeper — faster! 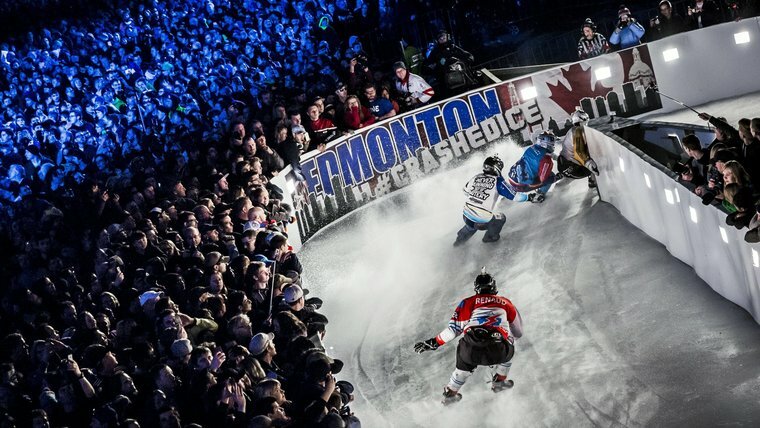 Edmonton was home to the most technical track on the 2015 Red Bull Crashed Ice tour. 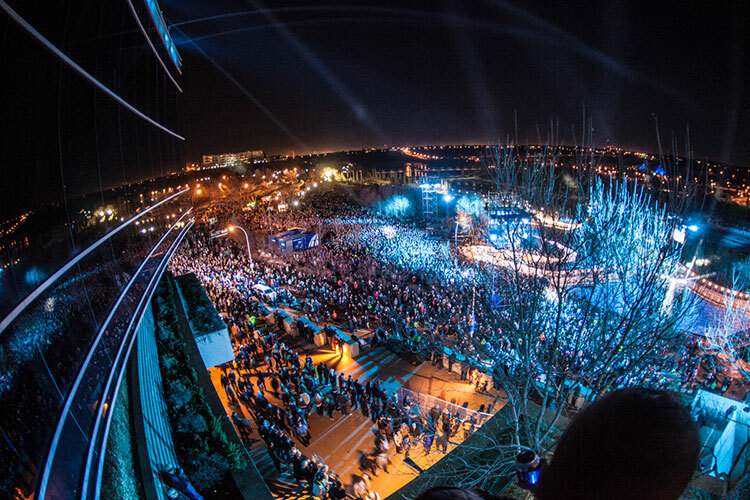 This was the first time that the outside of the Edmonton Convention Centre (SCC) building was activated for an event. Red Bull built a one-of-a-kind track that brought the sport to a new level. 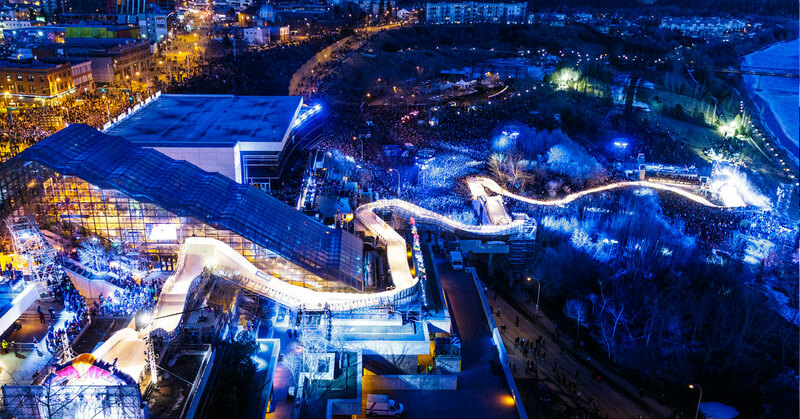 Top ice cross downhill athletes from across Canada and around the globe hurtled down the urban ice track built with massive drops, gaps, steps, and hairpin turns in front of thousands of roaring fans – all for the chance to win Red Bull Crashed Ice glory. The track began at SCC, right in the heart of the city and wound its way down into the river valley. The skaters gave everything and showcased their skills, technique, agility, stability, explosion, and endurance to race from top to bottom – facing a steep downhill section before crossing the finish line. Post by Edmonton Convention Centre. The actual build of the track took ten truckloads of steel, 415 metres of track, 23,625 square feet of ice surface and 12,000 hours to construct. On the day of the event, it was almost +15 degrees in Edmonton. That didn’t stop the ice from freezing though. Three high performance refrigeration units pumped 30,000 liters of saltwater brine (coolant) through the refrigeration system and then through the rubber mats covering the length of the track. This required a team of 8 ice makers spraying water in a fine mist onto the refrigerated mats 24 hours a day for 6 days to create the competition ice surface. The production of the event itself took 16 HD cameras including a 20-foot jib crane and one cable cam; several POV cameras and mics placed into the course; two HDTV production trailers; wireless retransmission system; wireless Intercom system connecting all the team members; and a fiber optic network to broadcast HD screens. There were more than 80 people working for 3 weeks to build the track and set up the audio-visuals. Partnerships brought the event here, and partnerships made the event come to life. A social media crew of 7 people each from the City of Edmonton, Edmonton Police Service, Edmonton Tourism, Red Bull, and our very own Social Media Specialist worked endless hours to engage the public and monitor the event online. The most asked question from the public: where to buy tickets? The second most asked question from the public: can I take a ride down the track after the event is over? Over 70,000 people in downtown Edmonton generated approximately 8 million dollars in economic impact.